I spent several days last week working with a friend in her pastry shop, then on Sunday I attended a potluck for which I had volunteered to bring a dessert. Since I had been surrounded by cakes, frostings and fillings, and lovely little petit fours all week, for my potluck contribution I was inspired to prepare some simple little cake squares out of my favorite almond cake. Filled with red raspberry jam and frosted with pale green frosting, they had a festive, Christmas-y look. Besides being appropriate for the season, the cake squares were perfect for a potluck. To me the ideal dessert for a potluck should be something that can be served in small, one or two bite portions. A small dessert is "pre-portioned" so people don't have to wrestle with knives, cake servers, or gooey spoons—they can just grab (ideally with their fingers) and go. Also, since there is always a selection of desserts at a potluck and people want to sample several, miniature desserts make it so they can do so with minimal guilt. If you are attending a potluck this season, there are many desserts that can be served in charming, miniature portions. Brownies and bar cookies of all kinds can be cut into any size you like—and, except for the ooziest bars and gooiest brownies, they make good finger food. I have posted several likely candidates over the course of the past year—Chocolate Truffle Squares with Candied Orange, Black Forest Brownie Squares and Pumpkin Chocolate Chip Bars. This time of year, a platter of a special Christmas cookie is always a good idea, too. As I mentioned at the beginning of the post, the cake squares that I took with me yesterday were made with an almond cake. But you could do the same thing with any favorite cake as long as it is a cake that has a fine, moist crumb so that it can be sliced cleanly. 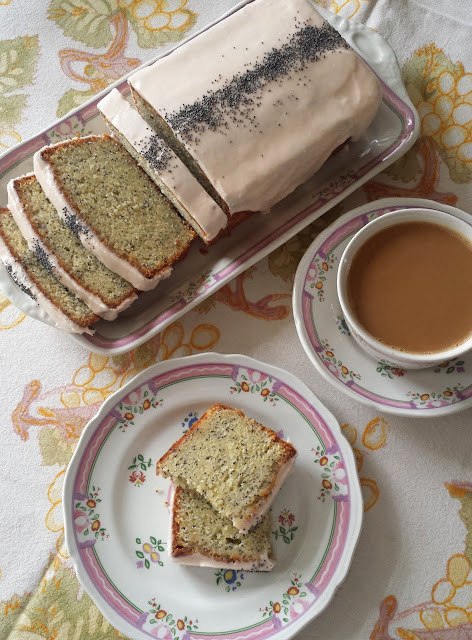 Pound cake would be a good choice, as would the Pistachio Cake I posted in March of this year. To make cake squares, bake the cake in a square or rectangular pan. The baked cake should be about 1 1/4 to 1 1/2 inches tall. The recipe for the pistachio cake, for example, is for a 10-inch round, single layer cake, but will bake perfectly in a single 9-inch square pan. A 9-inch round single cake layer will fit into an 8-inch square pan. I imagine that there are charts out there somewhere that will give exact pan conversions, but you can always measure pans by filling them with water and then measuring the volume (or weight). Also, if the depths of the pans you are comparing are the same, you can use a simple calculation of the area of a circle, square or rectangle to see if two pans can be used interchangeably. After you have decided on the kind of cake you want to make, decide if you want to split and fill the layer (with jam, citrus curd, frosting/buttercream...or nothing at all) and how you would like to "finish" the cake (with a glaze, icing/frosting/buttercream, a simple dusting of powdered sugar with a rosette of whipped cream and some berries, etc.). Obviously variations are endless. I really liked the version that I made, but I could have left the frosting an ivory color and topped the cake squares with a fresh raspberry. I also toyed with the idea of finishing the cake squares with chocolate ganache—almond, raspberry and chocolate are a magical combination—but decided in the end with green and red for Christmas. I would like to say that making these simple looking cake squares is easy, but I would be dishonest if I didn't tell you that you should have some facility with icing cakes and using a piping bag in order for them to turn out well. I am not a professional cake decorator so I will not attempt to explain the details of icing a cake and using a piping bag. I am certain there are web-sites and blogs devoted to this subject that do a much better job than I could. In my directions I will only mention the things that I think are particularly important. Above all, you must be neat, clean and precise. To prepare the cake squares you will need the cake (recipe below), seedless raspberry jam—approximately 1/3 cup, 1 recipe Honey Cream Cheese Frosting (see below)—tinted green with 2 or 3 drops of green food color, and green decorator sugar. Before building the cake squares, wrap the cooled cake layer and refrigerate until firm and cold. Using a serrated knife, split the cake in half horizontally. Spread a thin layer of seedless raspberry jam over the bottom half. Top with the remaining layer. Frost the top of the cake with the cream cheese frosting. It is not necessary to frost the sides because they will be trimmed away, but I usually slick a "crumb coat" onto the sides out of habit and to keep stray crumbs from mucking up my work area. If you want the frosting on the top to be perfectly smooth, after you have frosted the cake run an offset spatula that has been dipped in very hot water and then wiped dry over the top of the cake. You will need to make several passes, rinsing and drying the spatula between each stroke. Chill the cake until the icing and cake are firm—at least an hour, preferably longer. The slicing knife—like the offset spatula—must be dipped in hot water and wiped dry before each stroke. Cut the cake into 36 squares. There are many ways to organize your slices (cut the cake into 6 long thin rectangles and then make 6 cuts across these rectangles....cut the cake in quarters and then cut each quarter into 9 squares...etc. )—the most important thing is to make sure your knife is always hot and dry and that your cuts are evenly spaced. It helps to use a ruler. Top each of the squares with a small rosette of the frosting using a piping bag fitted with a star tip. Use a light hand to sprinkle some green decorator sugar over each cake square. If you like those little silver balls (dragees), you could sprinkle 3 or 4 over each little rosette. I should mention that these cake squares can't be made too far in advance. Traditional petit fours are completely covered with fondant or a poured glaze of some kind. This effectively seals the cut surfaces of the little cakes so that they won't dry out. Because these cake squares are only frosted on the top, they will dry out if made too far ahead. The cake can be frosted and filled well in advance—it needs to chill anyway—you just need to wait until closer to the time you will be serving it to cut it. Preheat the oven to 325°. Butter a 10-inch round or 9-inch square cake pan. Line the pan with parchment, butter the parchment and dust the pan with flour. Set the pan upside down and tap it once to remove all traces of excess flour. Using a stand mixer fitted with the paddle attachment, cream the butter until white. Add the sugar and almond paste and beat until fluffy and white again, 2 to 3 minutes on medium-high speed. Turning the speed down to low, add the vanilla and then add the eggs, one at a time. Beat again on medium-high speed after each addition until the batter returns to white foaminess, scraping down the sides of the bowl before adding the next egg. Finally, resift the cake flour mixed with the baking powder and salt directly over the batter and fold into the batter. Turn into the prepared pan and bake for 40 to 45 minutes. The cake is done when it is golden brown and a toothpick inserted into its center comes out clean. Let the cake cool in the pan for 10 minutes, then unmold onto a wire rack and let cool completely before cutting. Honey Cream Cheese Frosting (adapted from The Vineyard Kitchen ): Place 4 oz. of unsalted butter in the bowl of a stand mixer along with 4 1/2 oz. of confectioners' sugar, 1/8 t. salt and 1/4 t. vanilla. Beat on medium-high until light and fluffy—about 2 to 3 minutes. Scrape down the bowl. Add 8 oz. of cream cheese and beat until incorporated—about 20 seconds. Scrape down the bowl and drizzle in 2 T. of honey. Beat until smooth—about 15 seconds. Hi Julie, Thank you! Even if you don't try to make the little cakes, you should definitely try the almond cake-baked in the round pan, sprinkled with powdered sugar and served with whipped cream and berries...it's amazing. I have a feeling mine would not look that nice. :) Love almond flavored treats!